Daimos yells loudly, generating an aura of dark energy around himself. He yells again and causes the D.S. to be pushed back by the tremendous dark force. 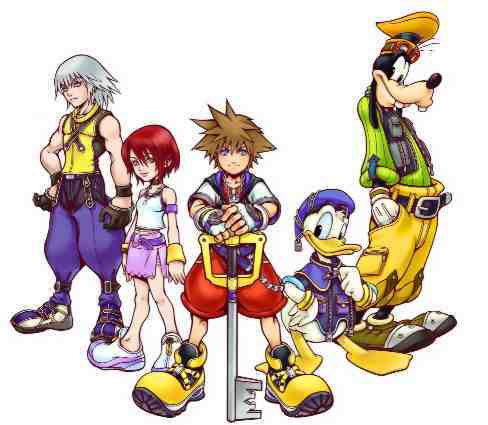 Daimos points his hand at the keyblades to his left, causing them to shoot out of the ground and revolve around him. He points his hand at the D.S. and sends the wave of keyblades surging at him. THe keyblades slash through the D.S. and embed themselves in the cliff side like stairs. Daimos looks over at Relix. "Let's go! Before it's too late!" He says then darts up the newly made platforms towards the U.E.M. "Right!" ,Relix says getting. (As UEM) Makes another wave of Keyblades to destroy the stairs and to impale Axel and Riku. Then D.S rides on top of the Keyblade wave splittng it apart going towards Daimos and Relix. Daimos slides to a stop then plants his sword into the ground, causing a chunk of it to rise just as the D.S. gets to them. The keyblades collide with the rock and its bursts apart. The D.S. charges through the rubble towards Daimos and Relix. Daimos picks up his sword and quickly impales the D.S. He then jumps onto on the the pieces of rock that is still in the air and darts up at the U.E.M. Relix now angery at the sight of him failing this training runs up the slope. He lands next UEM. "Doing this with one arm is not going to be easy. ", Relix then remembers the training he recived from the chaser book in Radient Garden. He then focuses on the keyblades down below and a whole whirlwind of them comes flying up and Relix driects them towards UEM. "I got you now." Axel gets on one knee and throws Roxis towards the enemy.Right after Axel turns around and runs at the enemy. "Deimos do the same as Relix"he yells, he then uses a ring of fire to pick up his own swarm of keyblades and launches them towards the enemy. "This should do some damage. "As soon as the keyblades are launched he jumps in mid air and grabs Roxas's leg to throw him at full force towards the enemy.He then falls upon the enemy himself and slashes at the enemy. "Aaaaagh"he yells as he puts all of his built up anger into this one attack. Roxas jumps down on top of the strange enemy and slashes at him with full force. All the keyblade waves hit UEM and Roxas comes in for the final attack. UEM is destroyed. Relix is not happy. "That was only level one." Dang man that was hard,"Roxas said exustly, How many levels Are There"? Daimos resheathes his sword then looks over at a group of keyblades to his left. He walks over to them and looks through them. He spots the Two Ultima Weapon keyblades, one old and one new. He picks up the newer one and looks at the other. "Hmm...I think I'll have to come back for this one...when I'm stronger." He says then turns to them with the weapon rested on his shoulder. Relix then picks up Old Ultima Keyblade. "I will go towards the east. Riku you south. Roxas and Axel west. Daimos north. "We'll meet back here. he then picks up Fenrir and pushes it into the ground. A burst of light comes from the blade into the sky reavealing the bluse Kingdom Hearts. "Here you can take a portal out of the virtual reality back to the real world or you can go to a virtual world(note that if you do go to that actual place there and make a topic in that world cuz it will be confusing.) "Later." Daimos nods then heads off towards the cliffs. He stops and looks over his shoulder at the others. "Good luck...and don't take anything here lightly." he warns then waves slightly and turns back towards the cliffs. He walks away. Axel looks to Roxas"Are you ready or should we look for better keyblades first?I'm all ready now i don't need any better weapons. (i don't know the names of the keyblades).Lets go. "Axel says to Roxas as he turns to walk away. Daimos looks up at the slightly ruined cliff. He jumps up along the keyblades still embedded in the rock and gets to the top. He looks over his shoulder at the crossroads then looks forward and continues on his way. When axel turns to follow Roxas, an unknown beast jumps up in front of him, and axel yells to Roxas"Roxas come back I might need your help with this. "as he draws his weapons.